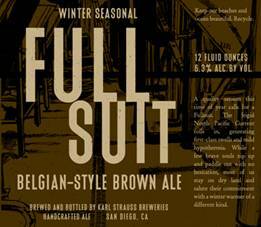 "Fullsuit is brewed with the changing seasons in mind. Firm toasted malt and roasted nut flavors are underpinned by a hint of vanilla that comes from aging the beer on French oak. Belgian ale yeast adds a peppery, fruity character to the beer’s slightly dry and warming finish, making it perfect for the (kind of) cold Southern California winter. Fullsuit pours a deep amber/copper hue with a very large, healthy off-white pillowy head with excellent retention. Lacing is thin with minimal cling on the glass. Body is very still with minimal activity. Even after a few minutes, there is still a decent film of head resting on top of the brew. We initially detected a nice sweet sugary aroma, sort of maple sugar like - we were very pleased. After the large, foamy head settled, the aroma became increasingly complex, with notes of raisins, cloves and very soft roasted malt notes. Over time, the roasted malt aroma increased in strength. This beer was very inviting. Initial taste is chock full of rich malts with some raisins in a silky smooth body. The back end reveals a subtle hop presence and at first some alcohol warmth but that has subsided through later sips. Medium in body and softly carbonated, the fullsuit Belgian-style brown is smooth and delicious. Initially, the sweet Belgian flavors coated our mouth with a nice sweet flavor. After sticking around for a long duration, our mouth was left rather dry - influenced by the roasted malts. Immediately provides high expectations with a phenomenal aroma, and does not disappoint with a delicious malt profile and a smooth body. Without researching, I believe this to be the first Belgian-style Brown we've reviewed and can say we are fans of the style. The distinction between this and an American Brown is in the nose as we picked up some moderate clove and the slight bite in the finish flavor. Reviewed on June 26th, 2010.